The European wild pig, more correctly the European Wild Boar (which term covers both the boars and sows), is commonly called the Euro in New Zealand. It is a hardy breed. 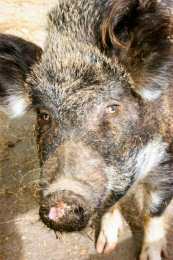 All domesticated pigs, even Asian varieties, are believed to have evolved from this European breed. In spite of the fearsome reputation of the European Wild Boar, domesticated Euros make good pets. They are born with stripes from nose to tail, fading when about six to nine weeks old. Colors range from yellow-sandy through to red-black. They have long manes and hair in winter with a woolly undercoat. They are great mothers, farrowing twice a year. Content and Photo Source: New Zealand Rare Breeds (http://www.rarebreeds.co.nz).